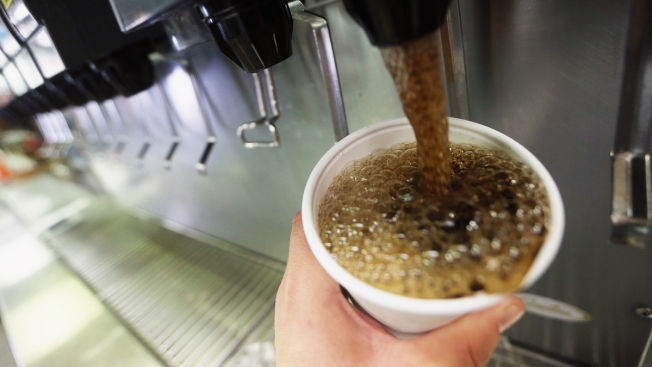 File image of a cup being filled with soda. A federal appeals court on Tuesday blocked a San Francisco law requiring a health warning on soda ads, saying the measure was misleading and would suppress free speech. A unanimous, three-judge panel of the 9th U.S. Circuit Court of Appeals stopped the 2015 ordinance from going into effect until a lawsuit filed by the American Beverage Association and other groups is resolved. The ordinance requires a warning on ads for soda and other sugar-sweetened beverages that appear on buses, billboards and structures in the city. Ninth Circuit Judge Sandra Ikuta said the warning is "not purely factual" and "unduly burdens and chills protected commercial speech." She cited U.S. Food and Drug Administration guidance that says added sugars can be part of a healthy diet when not consumed in excess. The warning was approved around the same time that several cities, including San Francisco, passed taxes on sweetened drinks to try to reduce consumption. Soda makers say such taxes could raise the costs of other groceries, not just drinks, and have not been shown to change people's behavior or reduce obesity. John Cote, a spokesman for the San Francisco City Attorney's Office, said officials were analyzing the ruling and evaluating all of their options. "San Francisco remains committed to being a leader when it comes to protecting the health of our residents, especially our children," he said. The American Beverage Association said in a statement that the 9th Circuit affirmed its position. "America's beverage companies believe there are better ways to help people reduce their sugar consumption," it said. In the ruling, Ikuta also said the city's warning was misleading because it was required only on beverage ads and not on ads for other products with equal or more added sugar. Additionally, the requirement that the warning cover 20 percent of ad space would overwhelm other elements of the ad, Ikuta said. The ruling overturned a lower court decision denying the American Beverage Association's request for a preliminary injunction against the law.